An optical illusion is an image or series of images that the brain processes in a different way than they are in reality. Alternately, some images have multiple interpretations if the viewer focuses on different colors or lines. Optical illusions are completely based on perception. A person’s mind might perceive an object as light or dark, big or small based on the objects around it. Therefore, optical illusions are created using contrasting designs, apparent depths, shapes and colors. The effects of an optical illusion might make a straight line seem curved or a brown square seem lighter than another one of the same color. Some optical illusions, such as the famous Throwing Cast Nets, actually appear to move before your very eyes. Other illusions such as Lilac Chaser do move, but trick your eyes into thinking objects are disappearing when they really are not. A third way to create an optical illusion is through depth perception. We portray distance in two-dimensional images based on the size and contour of lines. Painters such as M.C. 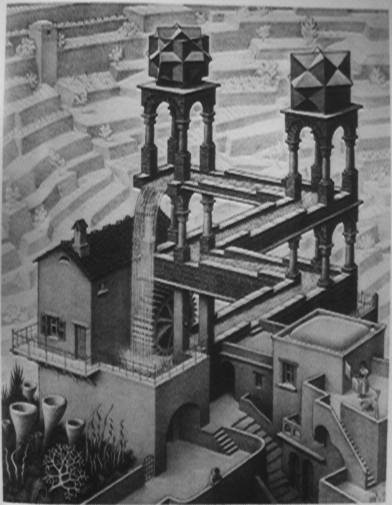 Escher have used these to create some confusing yet genius pieces of art. Finally there are cognitive illusions such as Rubin’s Vase where the viewer can see different, sometimes hidden objects if they focus on other colors and contours. Check out these fun and interesting examples of illusions below. 3 Guys: Can you figure out which man is the tallest? Click the Next button for other illusions. Bezold Effect: See how the color cyan appears different when it is displayed against white or black. This works with other colors too. Café Wall: Are the horizontal lines in this picture straight or are they slightly diagonal to varying degrees? Checkerboard: Which square on the checkerboard is lighter, A or B? The Dancing Lady: Which way is this lady spinning? If you see her moving clockwise, it is said you use the right side of your brain more than the left. If she’s moving counter-clockwise, you probably use the left side of your brain more. The Elephant’s Legs: Look at the elephant’s legs and feet. How many do you see? The Hering Illusion: Are the horizontal lines in this picture straight or slightly curved? Hermann Grid: Scan the sixteen black squares over with your eyes. Do you start to see black spots in the corners between them? Impossible Trident: At first glance this may look like an ordinary trident, but check again. Muller-Lyer Lines: Which line is longer, the one on the top or the one on the bottom? The Necker Cube: Is the red dot in this picture in a near or far corner of a cube? Stare at the dot for a bit and see if you change your mind. If you see it in the far corner, try to focus on the yellow part of the box. Rabbit and Duck: Which animal do you see in this picture? Look harder at the beak or ears. Rubin’s Vase: What do you see in this picture? Two vases or two people? Try focusing on the opposite color. Throwing Cast Nets: These are just pictures, but even a quick glance will make you think they’re moving. Waterfall: A famous painting by M.C. Escher. Water cannot flow upward, so how does this mechanism make any sense? Exploratorium: 24 optical illusions from the Museum of Science, Art and Human Perception. Gallery of Visual Illusions: Sixteen great pictures including the Zoellner Illusion, the Poggendorff Illusion and the Ebbinghaus Illusion. Optical Illusions!! : Take a look at nearly 100 illusions from James Madison University. Color Effects: Check out 7 cool optical illusions based on color. Then click around on the side bar for some other tricks that use geometry, contrast and other tricks. Illusions: 31 Awesome optical illusions (and a fake one) from the National Institute of Environmental Health Sciences. Illusions Gallery: The University of Massachusetts Lowell’s collection of links that lead directly to 35 illusions. There are even more links to illusions websites at the bottom of the page. Lightness Perception and Lightness Illusions: Watch flash movies that explain 11 different images that use black, white and gray shades to trick your eyes. Michael Bach: 93 Visual phenomena and optical illusions that will mess with your eyes through use of color, contrast and motion. Optical Illusions and Pictures: Dozens of visual phenomena and reversible pictures from 123 Optical illusions. See All You Can See: Three optical illusions (Top Hats, Frog Mouths, and What is It) from the National Eye Institute.